"Kṛṣṇa says, man-manā bhava mad-bhakto mad-yājī māṁ namaskuru (BG 18.65). He does not say any big, big, bombastic thing. Very simple thing, that 'Always think of Me, become My devotee, worship Me and offer obeisances.' It doesn't require M.A., Ph.D. education to learn these four things. Anyone, even a child, can do it. It is very easy. If you daily see the Deity in the temple, or if you have got Deity at home, even a child will be practiced to think of Kṛṣṇa. It is not at all difficult. And if you chant Hare Kṛṣṇa mahā-mantra, Hare Kṛṣṇa, Hare Kṛṣṇa, that is also thinking of Kṛṣṇa. So man-manāḥ, and if you continue this, then mad-bhakta, you become His devotee. Man-manā bhava mad-bhaktaḥ. Mad-yājī, then if you can, you can offer to Kṛṣṇa. Is it very expensive? No. Patraṁ puṣpaṁ phalaṁ toyaṁ yo me bhaktyā prayacchati (BG 9.26). You can offer Kṛṣṇa a little water or a tulasī leaf. Or if tulasī leaf is not available, any leaf. He does not say tulasī leaf. So what is the difficulty to secure a little water, a leaf or a small flower? Patraṁ puṣpaṁ phalaṁ toyam. The real thing is bhakti. Patraṁ puṣpaṁ phalaṁ toyam. So, mad-bhakta, if you are poorest of the poor you can become a devotee. Ahaituky apratihatā yenātmā samprasīdati (SB 1.2.6). If you want to become a devotee of Kṛṣṇa, there is no impediment throughout the three worlds within the universe. 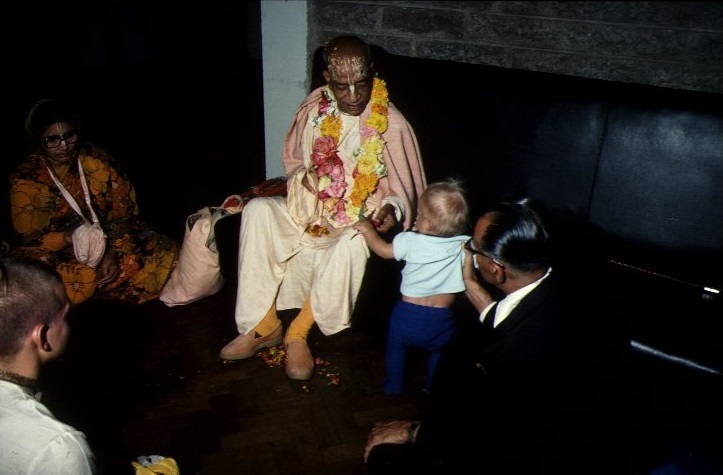 You can become a devotee, it is so easy."